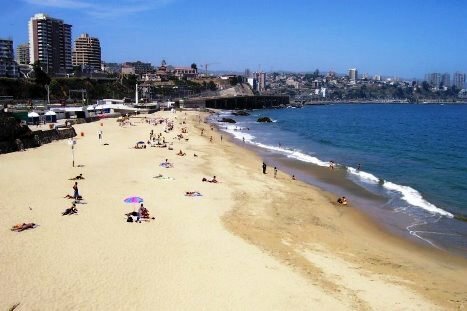 Ocean water in Viña del Mar is quite cold, and rarely warms above +16-18oC, but gives a great impression when is very hot. 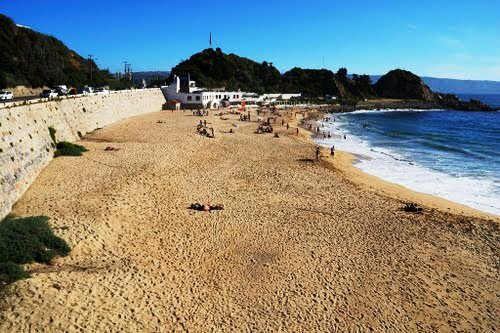 You will have the opportunity to soak up the sun, dared to plunge into the Pacific Ocean, play with your kids in the sand, drink a cool beverage or a cocktail at one of the nearby small cafes or bars and have a lunch in a seafood restaurant. In the evening here taken to stroll along the beautiful promenade, admiring the sunset. Caleta Abarca is the closest beach to our accommodation, it is located just 4 blocks from here. 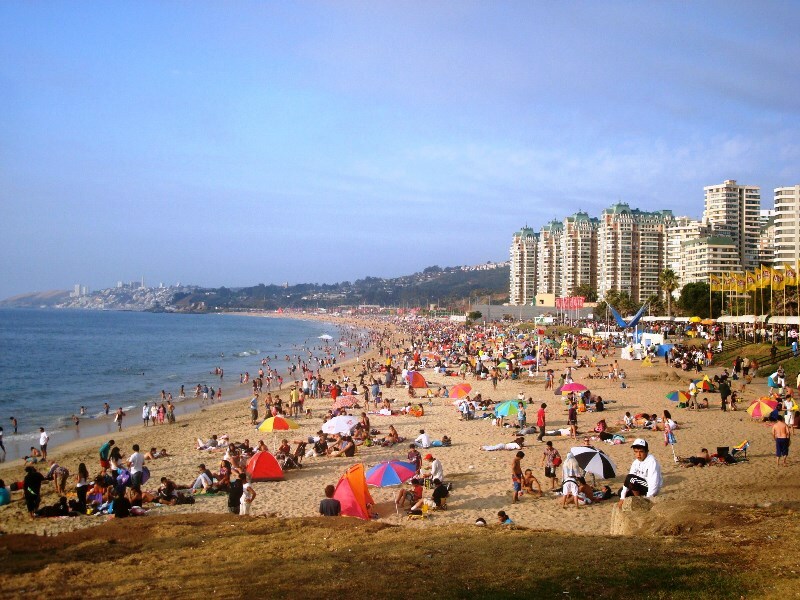 It is one of the busiest and principal beaches of Viña del Mar. This enclosed bay is situated an Avenida España and surrounded by the Hill Recreo on the south with the convent of the Capuchin Church on the cliff, and beautiful facades of the buildings of Castillo Hill on the east. The surrounding cove offers protection from fierce ocean currents, allowing safe swimming. The beach is usually visited by local residents but in the busy summer months gets quite crowded and vibrant. Visitors can take a walk on the promenade or relax on one of the benches. There are also children's play facilities, parking and a local discotheque. The picturesque little gardens are also fun to stroll through. This long strip of beach, characterised by its coarse sands and gentle waves, is located between Peru Avenue and Vergara Wharf. 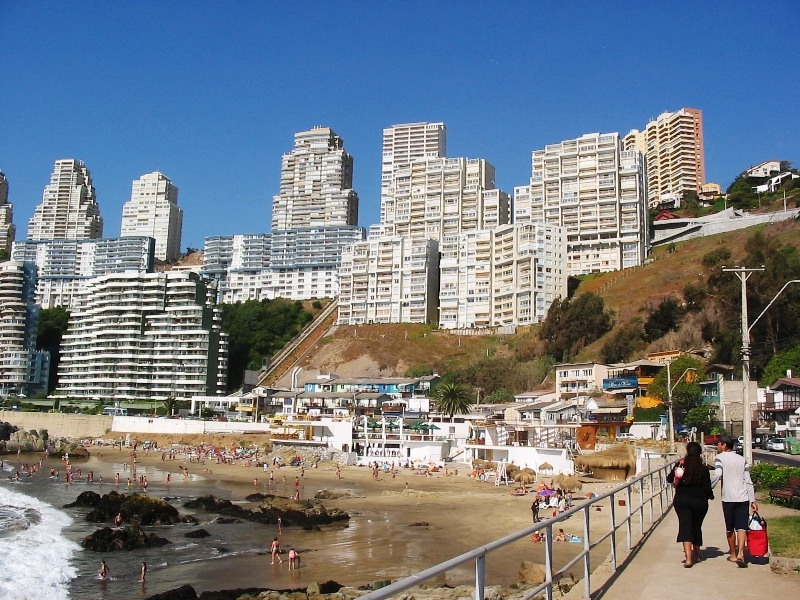 Proximity to the centre of Viña del Mar and the restaurant sector has made it highly popular among visitors. 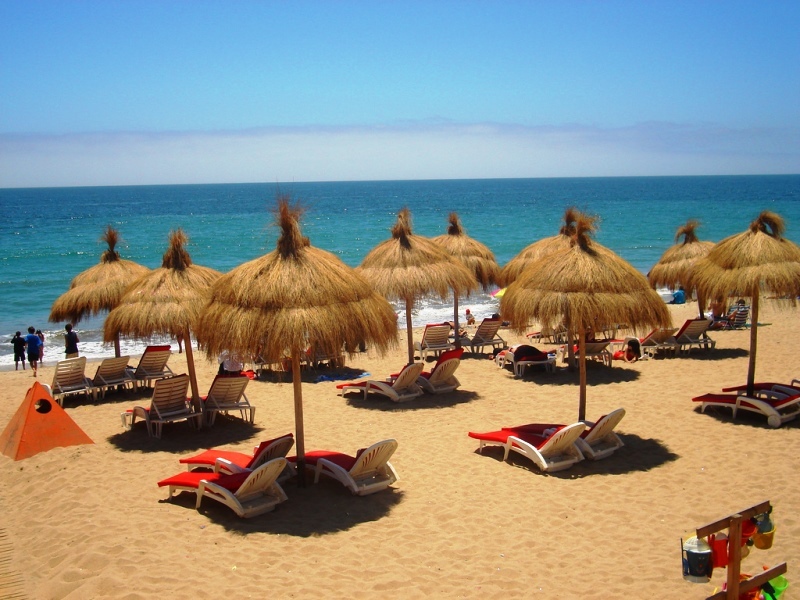 This beach is ranked as one of the most visited along with Reñaca. Its facilities include a fully modernized infrastructure, providing thus, everything needed for a day in the sand and the sea without having to go elsewhere to eat, have a shower or dressing. The best time for walking is at sunset, when you might well witness local anglers casting into the ocean. The pretty gardens behind the beach are also pleasant to walk in. Residents and visitors to tall apartment buildings on the other side of the road enjoy a privileged view of the cityscape from Valparaíso to Reñaca. Next to the Acapulco beach and pier Vergara there is another recreation place with special attention to children - the El Sol beach. It is located on Avenida San Martín between 11 and 14 North and has the same characteristics as Acapulco beach: sun, sand, and steps away from the mall, for your shopping, or eating something. Walking paths along the beach are decorated with plants and flowers, making this beach an attractive and colorful place to rest. 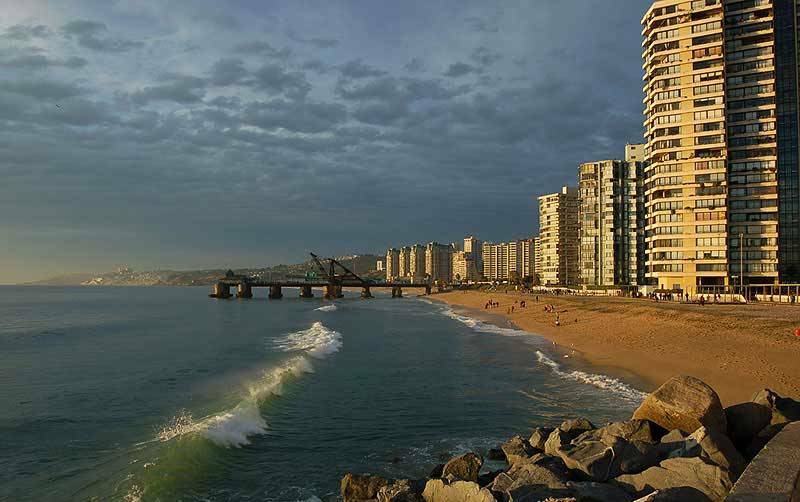 Located between 15 North and 19 North, Playa Blanca is one of the most central beaches of Viña del Mar, surrounded by elegant and modern buildings that have been built around him. Just steps from the famous Avenue Jorge Montt, this place this place is known for its monument of the Chilean rider Alberto Larraguibel, and the famous sundial. Especially for those who enjoy walks on the beach just yards from the town, Playa Blanca is an easy and cozy escape from the noise of the city. 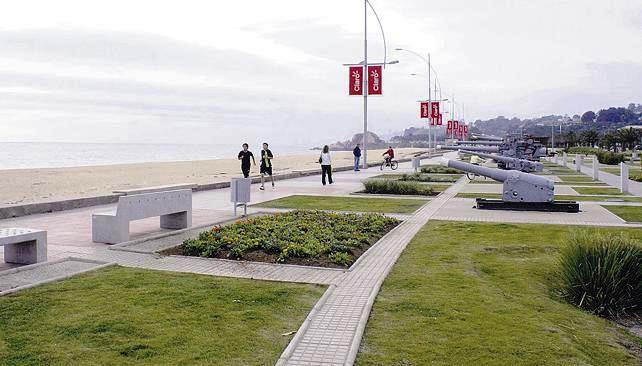 This project sponsored by the Municipality of Viña del Mar, with the support of the University Andrés Bello, is located within the renovated Coastal Park in the area Las Salinas. It stands out by its central court where visitors and locals enjoy tennis tournaments, football and volleyball. 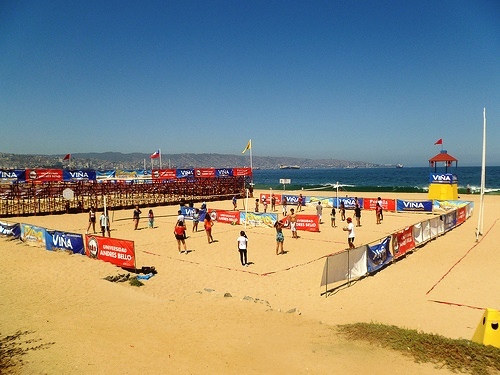 In the summer this beach comes alive to welcome hundreds of children and youth in various sports activities, for free, all this, as the city's Mayor Virginia Reginato says, to "encourage, one more time, sports, team participation and healthy living". Famous for the Museum of naval guns installed on it, the beach Los Cañones is located between the beaches Deporte and Los Marineros. Its historical importance lies in its proximity to various agencies of the Chilean Navy, in addition to being accessible to all those wishing to explore the various items of war that staggering by their size and solidity. Small and protected from the wind, with gentle and smooth waves that make it the favorite for swimming. It also has all amenities like restaurant, restrooms, showers and parking. Furthermore, its proximity to various restaurants make it an attractive choice if you want to spend the day at the beach. Located next to the Mariners beach, after a small cliff. and parking. 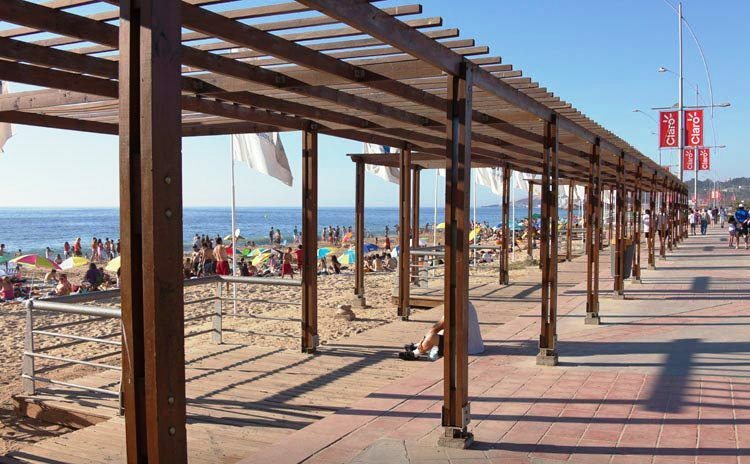 On the beach and across the road there are dozens of cafes, bars and pubs, and in the town you can find a variety of restaurants typical Chilean and international cuisine. It is the favorite youth center and the place where thousands of visitors gather in summer.